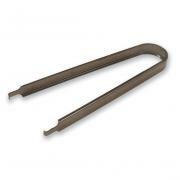 Detailed listing of our pin extractors. These quality stainless steel pin insertion tools service virtually all connectors conforming to Mil-C-26482 and Mil-C-26500 standards. 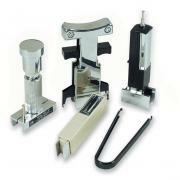 Designed for use with sub-miniature connectors. Three 5" long, color-coded pin insertion tools are included in the set which comes in a durable leather padded zipper case. 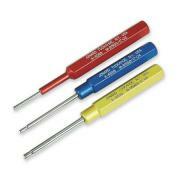 Contact sizes are 20 AWG (red, 0.040"), 16 AWG (blue, 0.063") and 12 AWG (yellow, 0.093"). These pin insertion tools service virtually all connectors conforming to Mil-C-26482, Mil-C-26500 with front release contacts made by such manufacturers as Amp, Amphenol, Bendix, Burndy, Cannon, Cinch, Continental, Elco, Flight, Pyle National and Deutsch. These quality stainless steel pin extraction tools service virtually all connectors conforming to Mil-C-26482 and Mil-C-26500 standards. Designed for use with sub-miniature connectors. Three 6.5" long, color-coded pin extractors are included in this pin removal set which comes in a durable leather padded zipper case. 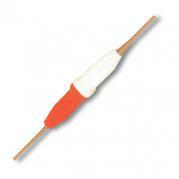 Contact sizes are 20 AWG (red, 0.040"), 16 AWG (blue, 0.063") and 12 AWG (yellow, 0.093"). These pin extractor tools service virtually all connectors conforming to Mil-C-26482, Mil-C-26500 with front release contacts made by such manufacturers as Amp, Amphenol, Bendix, Burndy, Cannon, Cinch, Continental, Elco, Flight, Pyle National and Deutsch. Safely insert and remove ICs with this five-piece set including 14-16 pin, 24-28 pin and 36-40 pin insertion tools and 8-24 pin and 28-40 pin extraction tools. Removes ICs without damaging the component. Extracts 8 - 24 pin ICs. Inexpensive tool for the insertion and extraction of D-Subminiature RS-232 pins. Metal tipped Insertion and Extraction Tool installs and removes Size 20 Pin and Socket Contacts For Connector Series: MIL-C-24308 and MIL-C-81659. Inexpensive tool for the insertion and extraction of High Density D-Subminiature RS-232 pins. 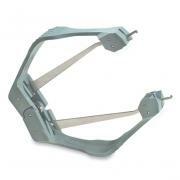 Metal tipped Insertion and Extraction Tool installs and removes Size 22 Pin and Socket Contacts For Connector Series: MIL-C-24308 and MIL-C-81659. 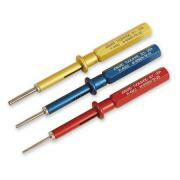 Molex tools for the insertion and extraction of D-Subminiature pins. 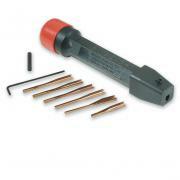 Easily extract and insert various size D-Sub pins with this self-contained compact tool. Inserts & extracts HD22 (28-22AWG), HD20 (28-20 AWG), HD20 posted, and also extracts HD20 (18AWG). Hollow handle holds all 6 tips, retaining hex screw and hex key. 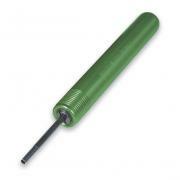 Safely removes PLCC chips from their sockets with a simple squeeze of the handle. 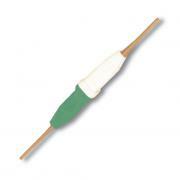 Extracts a range of PLCC sizes from 20-128 pins and is ESD safe. 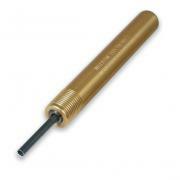 This low cost tool safely removes PLCC chips from their sockets with a simple squeeze of the handle. Extracts a range of PLCC sizes from 20-128 pins.